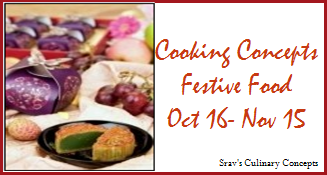 It’s Festival time with celebrations providing an opportunity for fun, customary feasting on food and family outings. The string of festivals for the season starts from August and run through January across the world. Beginning with Varalaxmi Varatham, Ganesh Chaturthi and Eid. Moves to Onam and next with Dussera. Carrying on with Diwali, Halloween, Thanksgiving, Chirstmas. Shortly begin with fresh year – New Year, Pongal and Sankranthi in January. As it is festival season, so I decided theme “Festive Food” for this month. In view of the fact that I am counting all the festivals around the world, I will be accommodating both VEG and NON VEG entries like Sweets, Desserts, Cakes, Cookies, Snacks, Tiffins, Savories….and so on whatever you cook for the festivals. Any numbers of entries are allowed, archives are also allowed if reposted and update with the link to the announcement page. Non-bloggers can also send their recipes along with picture to the above email id. Last date for the entries is November 15th 2011. Will send my entry/ies. Happy hosting. happy hosting,Sravani!! will send in my entries too.. Happy hosting.Will send my entries soon. Happy hosting .. perfect for the season. Happy hosting sras...I'll try to send in my entries. Congrats sravs for ur recipe published in e-book.Happy hosting,i already send my entry,try to send my other entries soon. linked one entry to ur event..
Nice event. I will send my entry. You have an interesting blog here. Sent an entry! Happy hosting!